You may have heard of the recent Stalking incident involving 36 year old Jeopardy contestant and Ivy League grad Claire Ogilvie. Ogilvie was indicted by a grand jury on charges that she broke into the home of a Virginia lawmaker and assaulted his wife. A year prior to the incident, the couple had relinquished ties with Ogilvie, having noticed an unsettling interest on her part (Ogilvie’s) with their family. Stalking is described as a course of conduct directed at a specific person causing him/her to feel fear. No one desires to live in fear of their surroundings 24/7, however that is exactly how at least 7.5 million Americans live in the course of one year. It seems the seriousness of this crime either goes unpunished or unpublished. In such cases a safety plan is pertinent and begins with ceasing all communications (online, in-person, telephonic) with the stalker. Victims should always trust their instincts, never downplay the danger and take all threats seriously. Live in constant fear of what the stalker may or may not do. Often unsure of who to trust. Due to the stress, many lapse into a depressive state, feeling hopeless, overwhelmed, tearful, or even angry. Some suffer eating problems, appetite loss, forgetting to eat, or even overeating. Feel confused, frustrated, or isolated because other people don’t understand why they are afraid. Stalking is a crime under the laws of all 50 states, the District of Columbia, the U.S. Territories, and the Federal government. However statistics show that 61% of female victims and 44% of male victims are stalked by a current or former intimate partner, 25% of female victims and 32% of male victims are stalked by an acquaintance. Harass you via calls, letters, texts, social media or e-mails. Monitor your whereabouts, your phone calls or computer use. Listen to the victim (vent, share). Show support for the victim. Remember that every situation is different, so allow the person being stalked to make choices about how to handle it. 15% of women and 6% of men have experienced stalking victimization at some point during their lifetime. 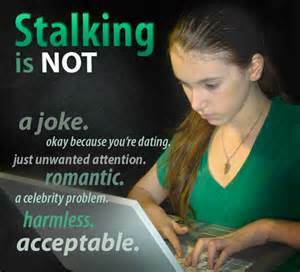 About half of all victims of stalking indicated that they were stalked between the ages of 11 and 17 with 14% of them being female victims and 16% of male victims. Make 2016 a year of Awareness in your home, your organization and community by sharing what you have learned about this topic. 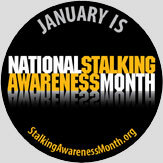 January is Stalking Awareness Month. Be a Supporter of NO MORE VIOLENCE!